I can’t believe it took me so long to discover free form tarts, but thanks to Food & Wine, I did and I’m hooked. This recipe is for a free form blueberry tart, and as the name implies, there’s no tart pan, pie shell or anything to hold it together other than pastry. In this case, the pastry is spiked with bits of candied ginger that add a lot of flavor considering the small amount. The crust is perfectly flaky, the blueberry filling isn’t overly sweet, and overall it is the perfect easy fruit dessert. Here’s the blueberry tart recipe I used from Food & Wine, and as mentioned, it couldn’t have been easier or more convenient; especially since I had my food processor on the counter ready to go. I made half of the dough and used only half of that, then made a quarter batch of filling. Todd loved it. Now I’ve got to try it a cherry version…. Looks beautiful and I love blueberries (baking a blueberry pie as we “speak”)….we call these galottes at my store and I have always meant to bake one myself. 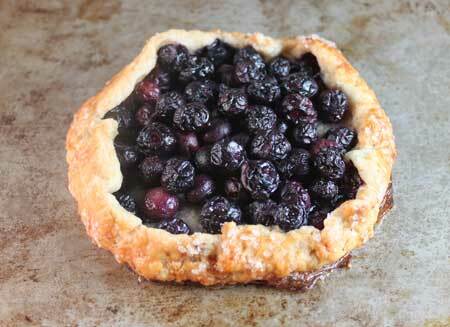 We sell blueberry and strawberry which are my two favorite berries…lovely lighter pie for hot summer days! I’ve never made a free form tart. Yours looks delicious! Wow. I wish I had seen this yesterday when I was looking for something to do with the blueberries in the fridge. But I can get more. The 1/4 of the original sounds exactly right for us. Adam, this one was really simple. Try making a half batch. Angela, I used a rimmed baking sheet with non-stick foil so there was no real run-off so to speak. Gloria, I don’t see why not. Emily, I recommend it. Issues have been a little slimmer lately, so you might as well try to find a good subscription deal rather than pay full price. Hopefully there will be more content in the fall. Linda, I can tell you that there’s a high ratio of crust to fruit. My little quarter batch could have served two to four. To be safe, I’d count on it as serving 8. Or you could look at the link and see what Food & Wine says. I hardly ever look at serving sizes. Debbie, hurry while the berries are in season! I’ve never made one of these before and think I need to try already. I love blueberry tarts so this should be great too! Might have to make that for my company tomorrow night. How many servings is it? Thanks for the recipe! I love Food & Wine. I really need to subscribe to it! I love fruit pies or tarts with fresh, non-soggy crusts-this looks like it would fit the bill. The crust is browned perfectly. I wonder if I could use frozen blueberries for this? I wonder if I could use frozen blueberries for this?